Morning clouds will give way to sunshine for the afternoon. High near 65F. Winds N at 10 to 15 mph..
A few clouds. Low 39F. Winds E at 5 to 10 mph. Bryan Steil won election handily Tuesday against Democrat Randy Bryce and independent Ken Yorgan. The win continues longtime Republican dominance of the 1st Congressional District. Rep. Paul Ryan of Janesville, who supported Steil, retires in January after 20 years in the post. With 98 percent of precincts reporting, Steil was ahead with 54.3 percent of the vote to Bryce’s 42.6 percent. Steil is a 37-year-old attorney for Charter NEX Films, a plastics manufacturer in Milton. During the campaign he frequently touted his background in solving problems in private industry and as a University of Wisconsin System regent. Steil stuck with his campaign themes when asked Tuesday night how he would work in a House of Representatives controlled by Democrats. That result was still in question when he spoke to The Gazette from his victory party in Burlington. “I’m focused on how do we grow the economy here in southeast Wisconsin—how we prepare workers for the jobs of the future, so people get better jobs and higher-wage jobs,” he said. Steil said improving the economy and the workforce is not a partisan issue. “I’m less focused on the partisan aspect and more on how we get things done,” he said. Steil also has praised the president’s trade deals and his moves to improve national security. Steil has said his top priorities also include lowering the cost of health care. He has not detailed a plan for doing so. Republicans have held the 1st District seat since 1995. 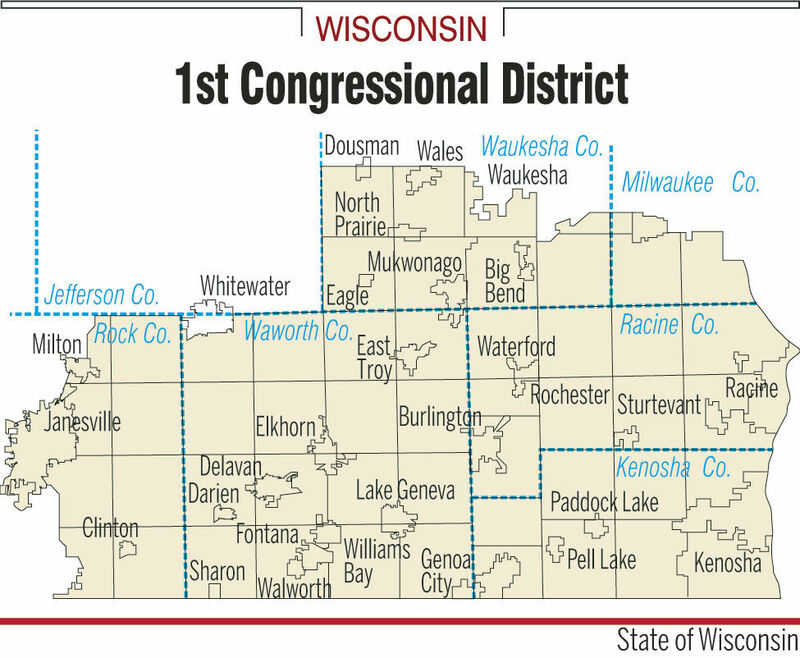 The district’s boundaries were changed over the years to favor Republican candidates. Democrats had hoped to flip the district by running Randy Bryce, an ironworker, union activist, Army veteran and cancer survivor. Some thought Bryce could pull votes from the ranks of blue-collar voters who favored Donald Trump in 2016. Steil raised $1.7 million as of Oct. 17, according to Federal Election Commission records. Bryce had raised $2.81 million. Steil had the support of a super PAC aligned with Ryan, the Congressional Leadership Fund, which ran ads attacking Bryce for crimes committed years ago. Bryce also was faulted for failure to pay child support, a mistake he corrected while running for Congress. Ryan’s political organization, Team Ryan, issued a statement Tuesday night, saying in part: “This race was very important to me. It’s the district that my family and I call home, and it’s the district that I have had the honor of representing in Congress for 20 years. Questions remain about the future of Ryan, 48, who has run for vice president and served as speaker of the House of Representatives.